Today, the youngest baby, and only boy in our extended family, had his baptism. Most family gatherings of ours involve large amounts of BBQ. After all, we do live in Texas! So, being vegan, we offered to bring a dish. We wanted to do something that everyone would enjoy and came up with this awesome salad. Best. Salad. Ever. We will be making this again. It was a huge hit at the baptism as well. Even all the meat eaters enjoyed it. So, I had to share it with you all. This dish is fairly easy to make and you can do most of the prep work the night before. Like I said above, you can cut the carrots, onion and mushroom ahead of time. Steam the edamame for a minute or two. Then throw all the ingredients in a large bowl and toss with the balsamic. If you wish, you can add an optional 1-2 T of olive oil. We did not and it still tasted great. This make a very large amount so you should be able to get a few meals out of it. Enjoy! 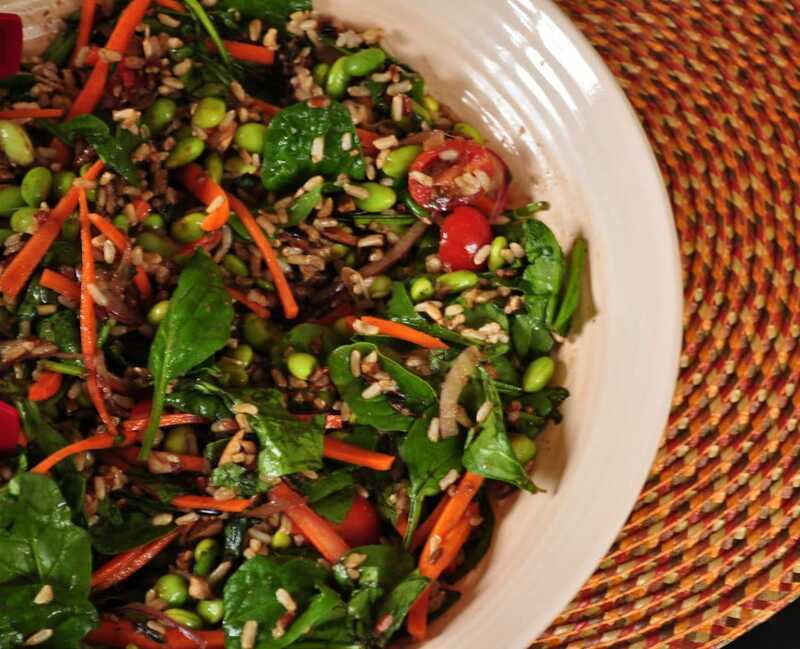 Do you let the rice cool before adding it to the salad or add it warm so it wilts the spinach a bit? We bought a wild rice/quinoa mix at Costco that will be perfect for this salad.